Identification: Wings are brassy burnt orange; upperside of both wings with black borders and black on the outer portions of the veins. The male forewing has a narrow black stigma. A pale form (pallida) is very rare. Life history: To find receptive females, males patrol grassy areas with a low meandering flight. Females lay eggs in strings on the host plant stem; the eggs overwinter and hatch the following spring. Caterpillars eat leaves and live in shelters of leaves tied together with silk. Adult skippers roost at night on grass stalks and in the morning bask with their wings at a 70 degree angle. Flight: One brood from mid-May to mid-July. Caterpillar hosts: Timothy (Phleum pratense) and other grasses. Adult food: Nectar from low-growing flowers including orange hawkweed, thistles, ox-eye daisy, fleabane, white clover, red clover, selfheal, Deptford pink, common milkweed, and swamp milkweed. Habitat: Open grassy places including meadows, hayfields, pastures, abandoned homesteads, grassy road edges. 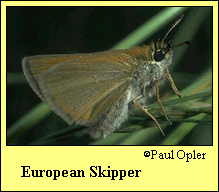 Range: This skipper was introduced accidently to North America in 1910 through London, Ontario. Eastern population: Newfoundland west to eastern North Dakota, south to southern Illinois and western South Carolina. Western population: western Colorado, Idaho, Montana, and British Columbia. The range is still expanding, perhaps due to the relocation of eggs in hay shipments. Management needs: Caterpillars of the European skipper can be pests on timothy grass.